And have started putting them together. The purpose of the trip was to attend my nephew’s wedding. I gave them this quilt and they loved it! I also brought along a quilt for my niece for her high school graduation. This entry was posted in EPP. Bookmark the permalink. 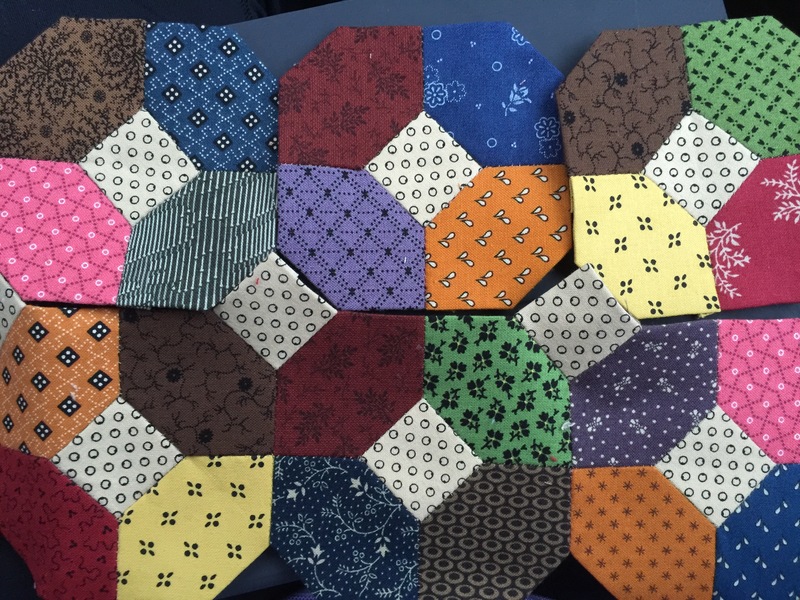 Love your EPP project – I like the on point! Lovely quilt gifts too – no surprise that they were well received at all! I’ve never seen EPP with that shape before. Hmmm…interesting…. Good luck. Lovely quilts to be sharing with your family. The EPP looks great either way. I’m envious of you being able to sew in the car. We had a slow 3.5hr journey on Friday but I have to keep looking forwards or I get a queezy stomach, so no reading either (I can sleep though!). I love this … I can’t wait to see this quilt finished. How big do you plan to make it? You might have said, but I can’t remember. We’ve got a road trip coming up in just over a week, so I need to gather up my EPP project so I can keep while in the road … it’ll be a 12-hour trip, too long to not have something to do to keep me busy. I love your layout and shape choices! Isn’t EPP so relaxing and fun! This is going to be a gorgeous quilt! 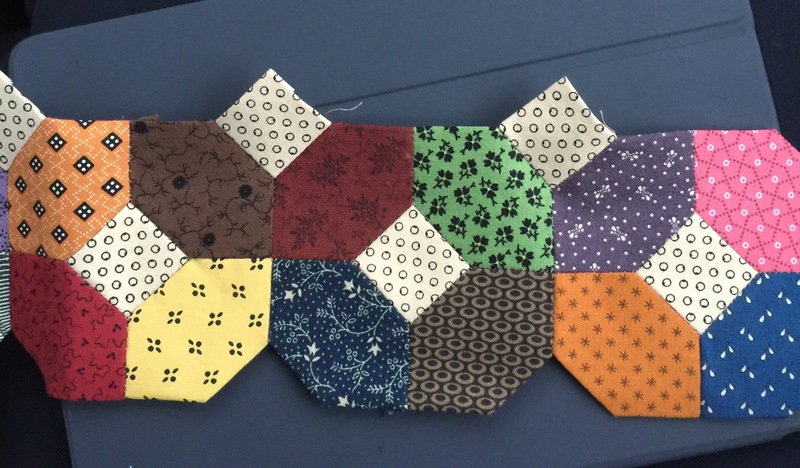 I love your EPP project…it makes me want to start a new one! Your quilts are fabulous! Your EPP project is very pretty. Wow, your intersections are precise. I personally like the first setting arrangement better. Love those quilts that you gifted. Enjoy your stitching and safe travels. Your quilted gifts are lovely! I vote for the blocks on point. It really makes a difference. Thanks for sharing and safe travels. 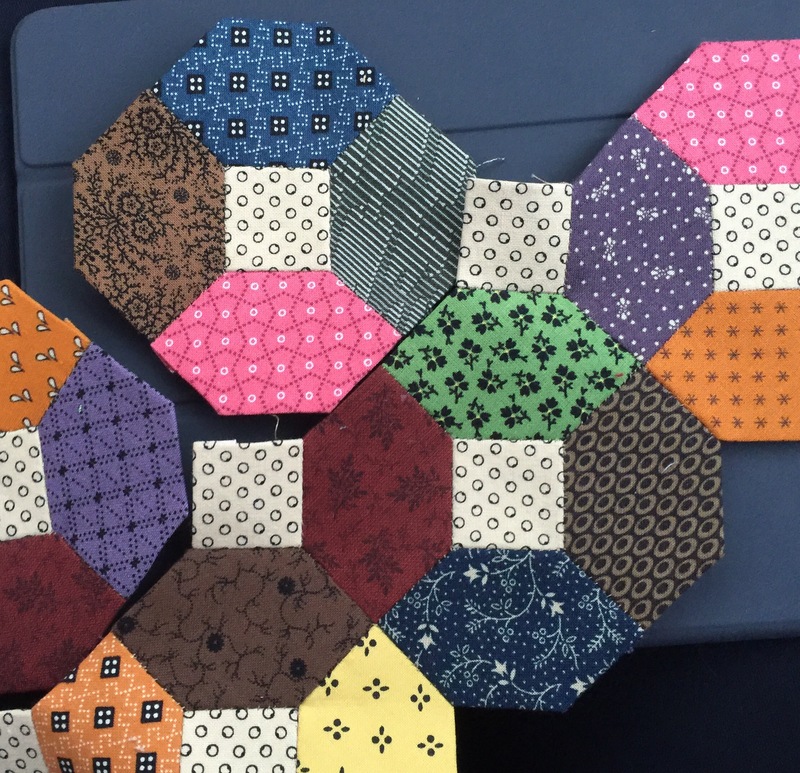 Love all the pretty fabrics in your EPP project. What a pretty quilt you made for your niece. ENjoy your slow EPP today! I love your EPP project. Great take with you project. Both your quilts are beautiful. 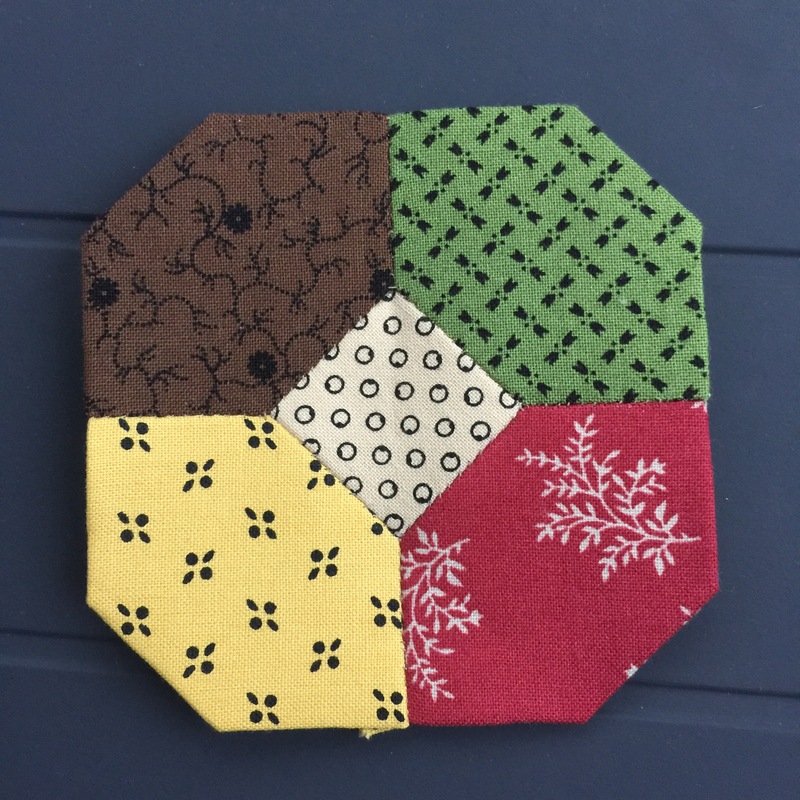 Love those little EPP blocks! Looking forward to seeing which setting you pick…. 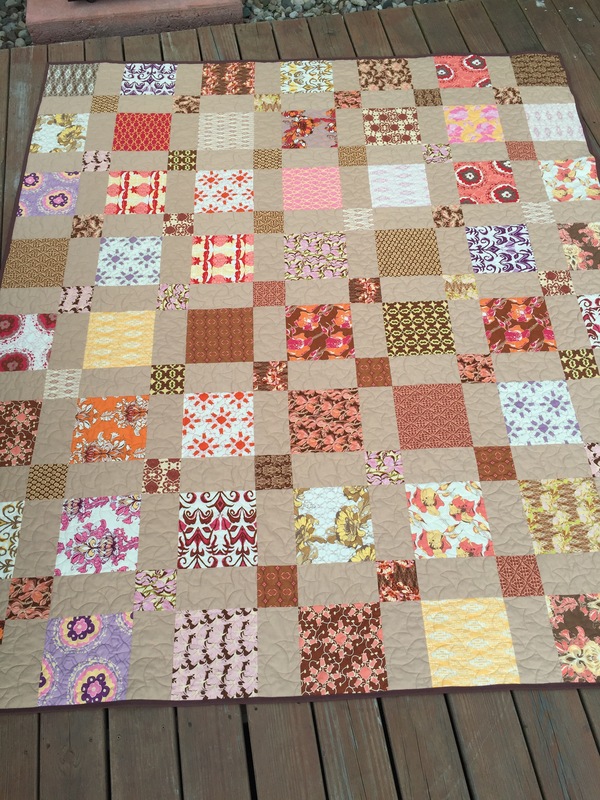 Both of the gifted quilts are great…love the fabrics in both! As I have mentioned before, it is so amazing how such simple shapes can result in such beautiful quilts!! Wish we had some of your rain here in Virginia….it is steamy, hot and humid….some rain would bring a welcomed relief! If we could vote, I’d vote for the EPP with the centers on point. That has more sparkle to it. The quilts you make for family are lovely. Giving quilts to family is such a joy! Of course they loved their quilts! They are both wonderful! 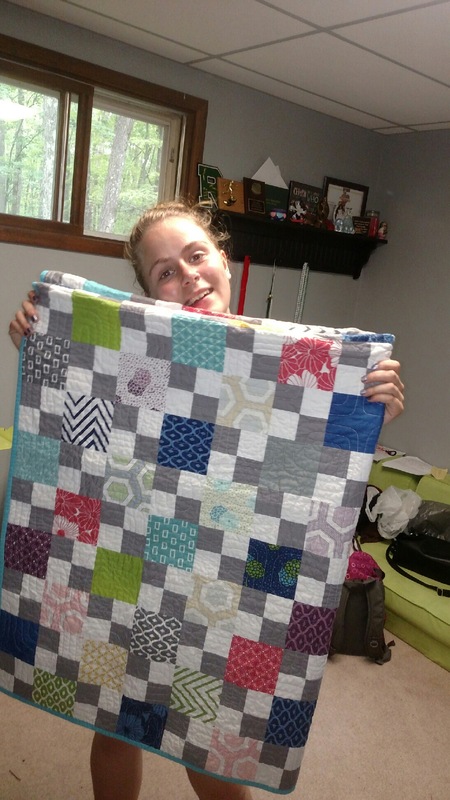 It just fills a quilter’s heart with joy when a gift is loved! I like both options for the setting of your EPP project. Such a hard decision! Every time I see one of your EPP projects I want to do one of my own! Guess I need to learn how to do that – it would be great to have a project to work on when I’m not around my machine. The quilt for your nephew is such a lovely color, and your niece looks super happy with her own quilt!